Courted by multinational companies and foreign heads of state over its rare minerals and potential oil resources, Greenland could win full independence from Denmark and join the European Union as a free state, according to one expert on the Arctic. Greenland’s leader Kuupik Kleist is boxing above his weight when it comes to foreign policy. Although the premier represents an autonomous island of just 57,000 people, within the last couple of months he has met with US Secretary of State Hillary Clinton, European Commission President José Manuel Barroso and representatives from the Chinese government. Greenland is a self-ruled territory in the Kingdom of Denmark. Although it was granted home rule in 1979, the Danish government is still in charge of foreign affairs, defence, police and justice, as well as financial policy. Denmark also provides the territory with an annual subsidy of 3.4 billion crowns (€457 million). Besides raising the interest of climate researchers, Greenland offers a treasure of natural resources, commodities and possibly oil. In a century where natural resources are becoming scarcer, the cold Arctic country is getting politically hotter. “I think it opens many doors for the country,” said Nukaaka Fleischer Hansen, a young Greenlander who works at the Ministry for Industry and Mineral Resources. “The outside world doesn’t know much about Greenland. I used to study in Norway, and many of them knew nothing about Greenland, which made me sad. It’s a beautiful country and it has many opportunities,” she said. Greenland has mines containing diamonds, gold, copper, platinum, uranium, aluminum and titanium as well as rare earth elements, which are used in high-tech products. However, the level of exploration in the mines is at an early stage and more mines could be found. There are around 30 – mostly foreign – mining exploration companies working in Greenland at the moment. One of them is a homegrown company called NunaMinerals, which has been operating in the country since 1999. “There’s an increased interest in the mines in Greenland from foreign companies. It’s one of the last parts of the world that really hasn’t been explored. So a lot of money is spent on exploring at the moment,” Dan Bång, chief financial officer of NunaMinerals, told EURACTIV. “This is Greenland’s future,” he said. NunaMinerals is currently involved in five big projects on the coast, including a diamond project together with the British-Australian mining and metals corporation Rio Tinto and a few smaller exploration projects. In total, it has 15-17 licences covering 10,000 square kilometres. Bång said it’s tough exploring the Greenlandic mines. The different projects take up a lot of time as the season during which the companies can explore is fairly short. The season runs from May or June until September or October and depends on the weather. However, the country is politically stable, and that is an important factor, Bång stated. At the moment mostly exploration companies from China, Canada and Australia are attracted by the Greenlandic mines. Their own mines are being emptied, and they want to find new projects. "Though Greenland seems far away, the projects are on the coastline so they are easy to access. And the potential is quite huge," NunaMinerals' CFO said. The Chinese are particularly interested in Greenland's iron and rare earth elements that can be used for green energy like wind turbines and hybrid cars, but also technology like computers, mobile phones and high-capacity batteries. China wants to be a leading country when it comes to green energy and technology, and though China dominates the world’s rare earth elements at the moment, they will become a net importer in the future. EU membership on the road to independence? Damien Degeorges is an associated researcher to the University of Greenland and the author of 'The Role of Greenland in the Arctic'. He said potential economic independence via the exports of natural resources could guarantee Greenland independence from Denmark, even though more would be required in order to secure a strong state. On paper, it could happen tomorrow, but Greenland is not ready. Another 20-30 years is more likely, but it depends on having enough money in the long term, better education and a change of mentality among the Greenlanders. "Given its strategic assets, a Greenlandic state would have to secure its development in the long term, avoiding the consequences of potential economic difficulties. Perhaps it should become part of a supranational cooperation like the EU if becoming independent. It could give Greenland an economic safety net," Degeorges told EURACTIV in an interview. The Arctic expert added that the generation born after 1985 is more pragmatic, and would probably have fewer problems rejoining the EU. Greenland left the European Community in 1985 over disputed fishing regulations. In the future, with the booming mining and metal sector, fishing quotas would only be a minor headache for the Greenlanders. The Greenlanders would, however, have to feel that they are not just being told what to do by the EU. "It’s also a question for the EU not to repeat the same mistakes or misunderstandings. I think the EU has corrected its mistakes so the relationship right now between Greenland and the EU is good," Degeorges said. "The EU should just continue to be a good, constructive and pragmatic partner and not disturb the development in Greenland," he added. Degeorges also highlighted that Iceland plays an important role for Greenland’s future. If Iceland joins the EU, then Greenland's road to the EU would become shorter. Iceland filed an application to join the bloc in 2009, and is currently in the middle of accession talks. Back in Greenland, Hansen said that a growing number of locals are hoping that the discoveries in the mines will eventually lead to full independence from Denmark. This would mean no longer having Denmark "standing on our shoulders". “If we compare to Iceland [which got its independence from Denmark in 1944], it has gone well for them for many years. Then they had a crisis, but I guess you have to experience that in order to move on,” Hansen stated. 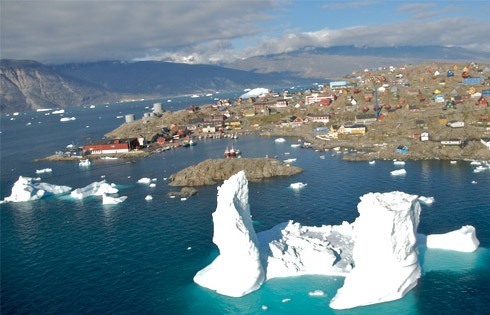 Around 57,000 people live in Greenland, making it the least densely populated country in the world. Only 44 politicians are in charge of the country (including ministers, MPs and mayors). Greenland was granted home rule in 1979, but the Danish government is still in charge of foreign affairs, financial policy and security - including defence, police and justice. Denmark provides a subsidy of 3.4 billion crowns (€457 million) per year. Sept. 2012: 10th Conference of Parliamentarians of the Arctic Region in Iceland. June 2013: Parliamentary elections in Greenland. Pay off the loans you defaulted on to Holland first. If Greenland were to become independent would it need or even want to join the EU? I’m not so sure. Look at their position. In some ways their situation is similar to Norway’s. That country’s vast energy resources are vital to a number of EU countries, such as UK and Germany, because it’s close and a reliable and stable supplier and those countries will buy its oil and gas regardless of its trade memberships. Greenland is a resource rich country within relative close proximity to NAFTA and the EU and frankly with so many potential buyers for its natural resources it would not need to be a member of any particular trade group and can just adhere to WTO rules. With a stable political environment it would have no problem attracting investment and is doing so. The downside of joining the EU for Greenland is that it would have to adhere to a myriad of rules, sacrifice sovereignty and with a small population would have very little influence in EU policy making. It may also have to accept EU interference in the management of its natural resources and how they’re traded and implement EU trade policies, some of which might not be to its advantage. As for fisheries, I imagine that it is a big employer in Greenland and would probably remain so as it is a traditional activity deeply rooted in their culture. Even if Greenland ends up making most of its revenues from metals, minerals & energy, fishing will remain highly emotive for those people. They will not appreciate fleets of giant Spanish trawlers with nets miles wide hoovering just about every living thing in their territorial waters. EU membership could be a disaster for their fisheries and for people who rely on it for a living. Look at what EU fisheries policy has done to the North Sea and other ‘EU’ waters. With the problems of who votes/vetos what amongst 27 members the EU has enough on its plate at present. They do not need Iceland, Greenland, Ukraine, &c. with all the ADDITIONAL problems any/all might bring. At least ONE (island) member ought to LEAVE the Europe they never really identify; this might make the vote/veto problem easy to adjust by treaty on the way to a loose confederation. In one respect, I feel sorry for Greenland. The coutry is going to be plundered of its natural resources by multinationals. There is no way Greenlanders can stand up to their pressure. Patrick is correct; there is NOT anet benefit to Greenland by joining the EU. The Brics are more of a market for finite resources; the trick is to keep these from being gobbled up at rates that maximize multi-national profits but leave the 99% who live there wanting. To avoid getting their resources pillaged Greenland would need strong governance and a strong adherence to the rule of law. When countries get ripped off with regard to their resources it is usually done in collusion with the country’s rulers ie corruption who enrich themselves at the expense of everyone else. I don’t see why that would have to be Greenland’s fate. I just wish you were right. I hope Greenland decides to let more companies in to responsibly mine their resources and generate lots of tax revenue for their country. The mining industry is proven to bring in infrastructure, jobs and help countries develop into strong economic powers. I am American, and I have mining to thank for developing so much of our cities and industries on the west coast in the early 1800’s. If you are interested in learning what modern mining can provide, please visit my website at themoreyoudig.com. In the early 19th century the capability to literally blow up whole mountains did not exist. At that time dangerous exploitation of workers (including children as young as 7 years) underground was the major issue. Today it is environmental concerns at centre stage. The world does need resource utilization but mining companies still have work to do in cleaning up their acts. I don’t know if EU will allow, but could it be an idea to join Norway, Liechtenstein, Iceland (for now) and Switzerland in EFTA? There are questions about EFTA’s future when Iceland most likely joins EU. This whole cooperation has been very beneficial for EFTA and it could need another country making the future a bit more safe for EFTA. But of course this wouldn’t only be beneficial for EFTA, it would also in my view do the same to Greenland as here in Norway. I’m not sure what economic support would be granted, but it would at least not necessarily have to deal with all EU directives and rules right? Of what benefit would ANY trading block be to a resource rich but low population of such as Greenland? The resources which they would export as of now go free entry almost anywhere so they can pick and choose where to send them. So they would be wise to pursue equality of relations with NAFTA, EU, EFTA, and ALL blocks, everywhere while keeping out the “miles wide” fishing nets which only serve to deplete a valuable resource. With care fishing could still be there when the finite resources are gone and the greedy mine and oil monopolists have moved on.